ASSOCIATIONS PROVE TIS BETTER TO GIVE THAN RECEIVE! If you have photos or events to share please send them to Regina Lemanowicz at ginalem1823@gmail.com and they will be posted. Several associations had their community outreach programs in November and December to spread holiday cheer. The Insurance Professionals of Orange County, the Insurance Professionals of Sacramento, the San Diego Association of Insurance Professionals, San Francisco Insurance Professionals, CA MAL’s and the South Bay Association of Insurance Professionals donated goods and made monetary donations to local charities in their communities. San Diego donated to Rachel’s Women’s Center, OPT Program, San Diego Blind Community. Orange County donated to Mary’s Kitchen, WHW and the Cambridge Assisted Living Home. The San Francisco Insurance Professionals and CA MAL’s walked for Alzheimer’s and SFIP also supported the Salvation Army and the Arf Foundation which is an animal rescue program. The South Bay Association of Insurance Professionals participated in the Long Beach Basket Brigade to help make 2,000 turkey dinner baskets for families in Long Beach. The Insurance Professionals of Monterey Bay donated to the American Red Cross for wildfire relief. The Insurance Professional of Sacramento donated to Mustard Seed School. This year Insurance Professional of Sacramento held their annual Holiday Dinner with the CPCU Society of Sacramento. Each year they do an ornament exchange and ask for donations for different Charities, This year they had the pleasure collecting items for the Mustard Seed School which is associated with Loaves and Fishes. Items included games, puzzles, toys and personal items along with gift cards and $200 in cash and checks. We want to thank Patti Middleton for delivering the items and thank everyone who donated to a great cause, it does make a difference. IPMB President Elaine Sorensen presenting donations to the American Red Cross. The CA Council Public Relations Chair, Dawn Manzano, CISR, created the Council Giveback Campaign. The campaign promotes community service and encourages one association or a combination of associations from the Central, Northern and Southern areas to each take a turn sponsoring a community action event during the year. This month we spotlight the SAN DIEGO ASSOCIATION OF INSURANCE PROFESSIONALS (SDAIP) for sponsoring and planning the event for Southern California. SDAIP celebrated their 81st birthday this year. During these 81 years the association and their members have continually given back to local charities within their community. This year was no exception! SDAIP stepped up to the plate for Southern California by having a donation drop off collection night. Members donated paper goods & toiletries for Rachel’s Women’s Center. Rachel's Women's Center provides day shelter for women. Services include: - breakfast - lunch - crisis counseling - case management - street outreach - referrals - support and education group - legal clinic - 12-step program - shower and laundry facilities. CA Council Young New Professional Liaison, Christina Hernandez, CIC, AAI, with the help of SDAIP's Public Relations Chair Margarita Casillas involved their employer, Snapp & Associates Insurance Services, Inc. They offered their office for the donation drop off location. Almost 40 bags of items were donated and will be given to the shelter in time for the holidays. SDAIP has served luncheon at the center every Saturday for over ten years. Nancy Trejo, CPCU, CIC, AIP coordinates the luncheon and the volunteers months in advance. The volunteers pick up the food and then serve lunch to the women in the center. Everyone involved in this community action project is greatly appreciated and SDAIP could not do it without the member’s time and generosity. SDAIP members are involved in other local charities. Members walk for breast cancer, autism and cystic fibrosis. They support the San Diego Blind Community, the Grossmont College Office Professional Program, Adopt a Family and Holiday Toy Program for children. They were proud and honored to receive the E.C. Smith, Jr. Memorial Award for Community Action for 2017 at the Region VII Conference. 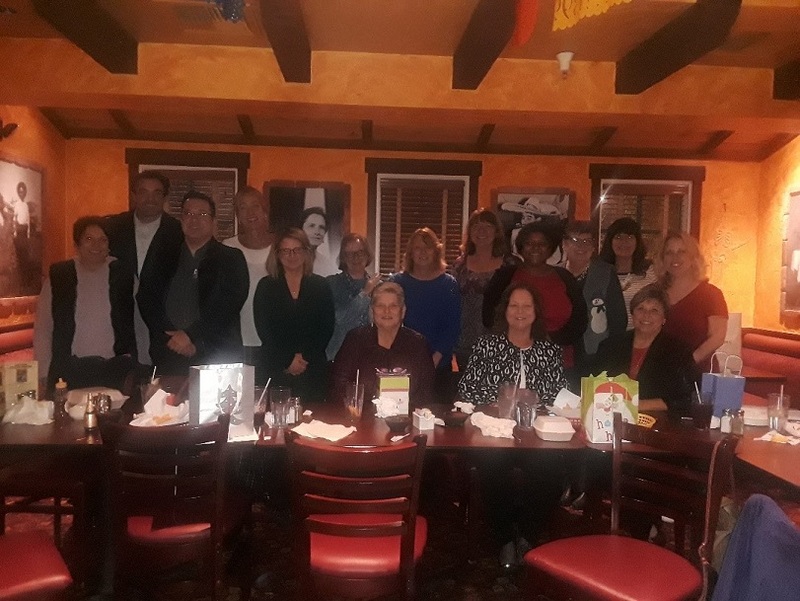 Council Director, Christine Chandler Tillett, PHR, CLP and the California Council Cabinet congratulates the members of the San Diego Association of Insurance Professionals for all you do for your community and IAIP! Thank you! We can’t wait to see what your 82nd birthday brings.